Angola went through the worst inflation from 1991 to 1995. In early 1991, the highest denomination was 50,000 kwanzas . By 1994, it was 500,000 kwanzas . In the 1995 currency reform, 1 kwanza reajustado was exchanged for 1,000 kwanzas . The highest denomination in 1995 was 5,000,000 kwanzas reajustados . In the 1999 currency reform, 1 new kwanza was exchanged for 1,000,000 kwanzas reajustados . The overall impact of hyperinflation: 1 new kwanza = 1,000,000,000 pre-1991 kwanzas . Argentina went through steady inflation from 1975 to 1991. At the beginning of 1975, the highest denomination was 1,000 pesos . In late 1976, the highest denomination was 5,000 pesos . In early 1979, the highest denomination was 10,000 pesos . By the end of 1981, the highest denomination was 1,000,000 pesos . In the 1983 currency reform, 1 Peso Argentino was exchanged for 10,000 pesos. In the 1985 currency reform, 1 austral was exchanged for 1,000 pesos argentine . Disinflation was gradual, with inflation falling from 1,344 percent in 1990, 84 percent in 1991. In the 1992 currency reform, 1 new peso was exchanged for 10,000 australes . The overall impact of hyperinflation: 1 new peso = 100,000,000,000 pre-1983 pesos . The inflation rate for 1992 was 17.5 percent, 7.4 percent in 1993, 3.9 percent in 1994 and 1.6 percent in 1995. By 1995, government expenditure represented 27 percent of Argentina's GDP. Austria became a republic after World War I. It continued to use the Krone as before in the Austria-Hungarian empire. However, post-war inflation, reaching a peak of 134 percent between 1921 and 1922, led to its collapse. The Krone was replaced by the Schilling at the rate of 10,000 Kronen equal 1 Schilling . Belarus went through steady inflation from 1994 to 2002. In 1993, the highest denomination was 5,000 rublei . By 1999, it was 5,000,000 rublei. In the 2000 currency reform, the ruble was replaced by the new ruble at an exchange rate of 1 new ruble = 2,000 old rublei . The highest denomination in 2002 was 50,000 rublei , equal to 100,000,000 pre-2000 rublei . Before 1984, the highest denomination was 1,000 pesos bolivianos . By 1985, the highest denomination was 10 Million pesos bolivianos . In the 1987 currency reform, the peso boliviano was replaced by the boliviano which was pegged to US dollar. For most of the early part of then 20th century, Brazil's money was called Reis , meaning "kings". By the 1930s the standard denomination was Mil Reis meaning a thousand kings. By 1942 the currency that devalued so much that the Vargas government instituted a monetary reform, changing the currency to cruzeiros (crosses) at a value of 1000 to 1. In 1967 the cruzeiro was renamed to cruzeiro novo (new cruzeiro), and three zeros were dropped from all denominations. In 1970 the cruzeiro novo was renamed, dropping the "novo" and once again being called simply the cruzeiro . During the 1970's while the Brazilian economy was growing at 10% a year, inflation was running anywhere between 15 to 300%. By the mid 1980s inflation was out of control reaching a peak of 2000 percent. In 1986 three zeros were dropped and the cruzeiro became the cruzado (crusade). In 1989, another three zeroes are dropped and the cruzado becomes the cruzado novo . In order to avoid confusion and not associate the new currency with previous monetary policy, the cruzado novo is renamed the cruzeiro with no change in value in 1990. By 1993, three more zeros are dropped from the cruzeiro which becomes known as the cruzeiro real . In 1994 the cruzero real is replaced by the real (royal), worth 2.75 old cruzeiros reais . As a result of these measures, prices dropped dramatically from July 1994 onwards and by 1997, inflation had been reduced to standard international levels. The overall impact of hyperinflation: 1 (1994) real = 2,700,000,000,000,000,000 pre-1930 reis . Bosnia-Hezegovina went through its worst inflation in 1993. In 1992, the highest denomination was 1,000 dinara . By 1993, the highest denomination was 100,000,000 dinara . In the Republika Srpska, the highest denomination was 10,000 dinara in 1992 and 10,000,000,000 dinara in 1993. 50,000,000,000 dinara notes were also printed in 1993 but never issued. China saw an extended period of hyperinflation shortly after the Central Bank of China took complete control of the money supply and began issuing fiat currency. In June 1937, 3.41 yuan traded for one US dollar. By May 1949, one US dollar fetched 23,280,000 yuan for anyone who cared to have some. For more information on the subject click here . Danzig went through the worst inflation in 1923. In 1922, the highest denomination was 1,000 mark . By 1923, the highest denomination was 10,000,000,000 mark . Henry VIII debased the coinage of England as a means of raising revenue from 1543 to 1551 in what is known as the "Great Debasement". In 1560, Elizabeth I and her advisors, foremost among them being Sir Thomas Gresham (of Gresham's Law ) brought about stability by establishing the pound sterling and began to recall the earlier debased coinage and reminting them to remove the base metal component. The pound sterling was valued as one troy pound of high purity sterling silver. Britain suffered through a long period of moderate inflation from 1935 to 1970. 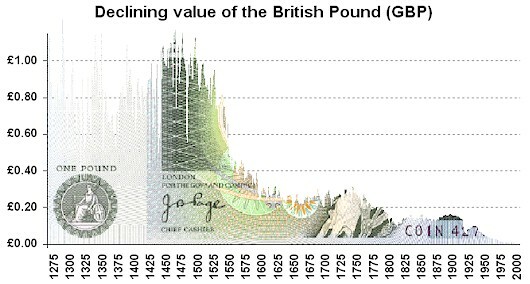 Below is a chart showing the falling value of the current British currency since inception (Data from MeasuringWorth.com ). During the German occupation of Greece (1941 to 1944), the monthly inflation rate peaked at 8.55 billion percent in 1944. Prices doubled every 28 hours. In 1943, the highest denomination was 25,000 drachmai . By 1944, the highest denomination was 100,000,000,000,000 drachmai . In the 1944 currency reform, 1 new drachma was exchanged for 50,000,000,000 drachmai . Another currency reform in 1953 replaced the drachma at an exchange rate of 1 new drachma = 1,000 old drachma . The overall impact of hyperinflation: 1 (1953) drachma = 50,000,000,000,000 pre-1944 drachmai . In the spring of 1789 the French Assemblee decreed the issuance of 400 million paper livres , known as assignats , secured by the properties that had been confiscated from the Church during the revolution. Over the following years, the Assemblee continued issuing greater quantities of assignats and in addition to price controls, dictated a death sentence on anyone selling the notes at a discount to gold and silver livres . By late-1795 the amount had reached 40 billion and a new currency was issued, the mandat , which promptly lost 97% of its value over the next two years. In 1797, both paper currencies were recalled and a new monetary system based upon gold was instituted. Georgia went through the worst inflation in 1994. In 1993, the highest denomination was 100,000 laris . By 1994, the highest denomination was 1,000,000 laris . In the 1995 currency reform, 1 new lari was exchanged for 1,000,000 laris . During WWI, Germany borrowed heavily expecting that they would win the war and have the losers repay the loans. In addition to these debts, Germany faced huge reparation payments. Together, these debts exceeded Germany's GDP. In 1923, when Germany could no longer pay reparations, French and Belgium troops moved in to occupy the Ruhr, Germany's main industrial area. Without this major source of income, the government took to printing money which resulted in hyperinflation took hold. At its most severe, the monthly rate of inflation reached 3.25 billion percent, equivalent to prices doubling every 49 hours. The U.S. dollar to Mark conversion rate peaked at 80 billion. Some countries eased off on Germany's war reparation burden and a new interim currency, the Rentenmark , secured on mortgages on land and industrial property restored stability. In 1924, the Reichmark , replaces the Rentenmark and has an equivalent to the pre-war gold mark. During the German occupation of Greece (1941 to 1944), the monthly inflation rate peaked at 8.55 billion percent. Prices doubled every 28 hours. Two currency reforms, one in 1944 and another in 1953, saw the new drachma replace 50 trillion pre-1944 drachma . Hungary went through two hyperinflationary periods. From 1922 and 1924 the inflation in Hungary reached 98%. This seems quite timid when compared to the inflation rate of 41.9 quintillion percent reached in mid-1946 recorded as being the worst in modern history. At this rate prices doubled every 15 hours. By July 1946, the 1931 gold pengo is worth 130 trillion paper pengos . The Hungarian National Bank has the dubious honour of circulating the largest denomination banknote - that being the 100 quintillion pengo . In more recent times, Japan experienced post-WWII hyperinflation in which consumer prices rose by 5,300%. There is also the issuance of military yen (also known as banana money) to soldiers of both the Imperial Japanese Army and Navy. This currency was first issued during the Russo-Japanese War of 1904 and reached a crescendo during the Pacific War. During this time, military yen was forced upon the local population of occupied territories. Military yen was printed without regard for inflation, unbacked by gold and could not be exchanged for Japanese yen . When the Japanese occupied Hong Kong, military yen was forcibly exchanged with Hong Kong dollars at a ratio of 1 to 2. Anyone caught with Hong Kong dollar was to be tortured. After the exchange, the Japanese military purchased supplies and strategic goods from the neutral Portuguese port of Macau using Hong Kong dollars . On 6 September 1945, the Japanese Ministry of Finance announced that all military yen became void thereby leaving overseas holder of military yen with pieces of worthless paper. Krajina went through the worst inflation in 1993. In 1992, the highest denomination was 50,000 dinara . 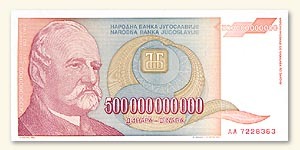 By 1993, the highest denomination was 50,000,000,000 dinara . This unrecognized country was reincorporated into Croatia in 1998. The Madagascan franc lost nearly half its value in 2004. On 1 January 2005 the Madagascan ariary replaced the previous currency at a rate of 1 ariary for five Madagascan francs . In May 2005 there were riots over rising inflation suggesting the situation wasn't over. Mexico defaulted on its external debt in 1982, and experienced several years of inflation. On 1 January 1993, the Bank of Mexico introduced a new currency, the nuevo peso which was equal to 1,000 old pesos . Before 1987, the highest denomination was 1,000 cordobas . By 1987, it was 500,000 cordobas . Nicarauga went through a currency reform in 1988 which saw 1 new Cordoba replace 1,000 old cordobas . In the mid-1990 currency reform, 1 gold Cordoba equaled 5,000,000 new cordobas . Total impact of hyperinflation: 1 gold Cordoba = 5,000,000,000 pre-1987 cordobas . Peru went through the worst inflation from 1984 to 1990. The highest denomination in 1984 was 50,000 soles de oro . By 1985, it was 500,000 soles de oro . In the 1985 currency reform, 1 intis was exchanged for 1000 soles de oro . In 1986, the highest denomination was 1,000 intis . It was 5,000,000 intis by 1990. In the 1991 currency reform, 1 nuevo sol was exchanged for 1,000,000 intis . The overall impact of hyperinflation: 1 nuevo sol = 1,000,000,000 pre 1985 soles de oro . 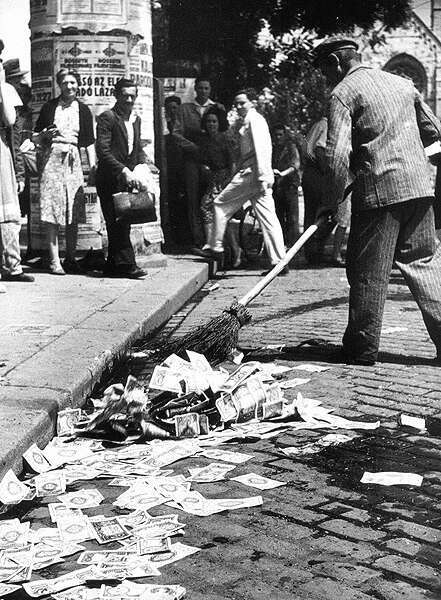 Poland suffered two bouts of hyperinflation. The first occurred from 1922 to 1924 when inflation rates reached 275%. After three years of hyperinflation, the 1994 currency reform saw 10,000 old zlotych exchanged for 1 new zloty . Romania is still working through steady inflation. The highest denomination in 1998 was 100,000 lei . By 2000 it was 500,000 lei . In early 2005 it was 1,000,000 lei . 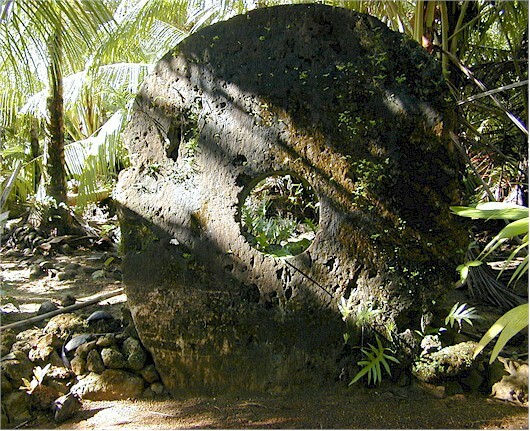 In July 2005 the leu was replaced by the new leu at 10,000 old lei = 1 new leu . Inflation in 2005 was about 10%. In 2006 the highest denomination is 500 lei (= 5,000,000 old lei ). In the words of Del Mar in his History of Monetary Systems , "for nearly two centuries, during which all that was admirable of Roman civilization saw its origin, its growth and its maturity. When the system fell Rome had lost its liberties. The state was to grow yet more powerful and dreaded, but that state and its people were no longer one." 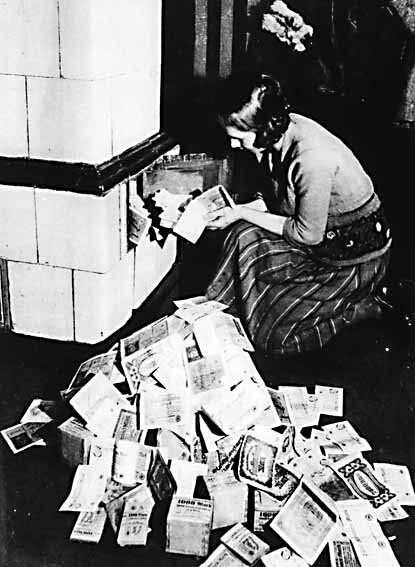 Severe inflation existed in the late 1940s due to factors such as corruption and the 2-2-8 Incident. Increasingly higher denominations were issued on the island, up to one million yuan . The new Taiwan dollar was issued in 1949 at a ratio of 40,000-to-1 against the old Taiwan yuan . Throughout the 1990s Turkey dealt with severe inflation rates that finally crippled the economy into a recession in 2001. The highest denomination in 1995 was 1,000,000 lira . By 2000 it was 20,000,000 lira . Recently Turkey has achieved single digit inflation for the first time in decades, and in the 2005 currency reform, introduced the New Turkish Lira ; 1 was exchanged for 1,000,000 old lira . Ukraine went through the worst inflation between 1993 and 1995 with inflation rates peaking at 1400% per month. Before 1993, the highest denomination was 1,000 karbovantsiv . By 1995, it was 1,000,000 karbovantsiv . 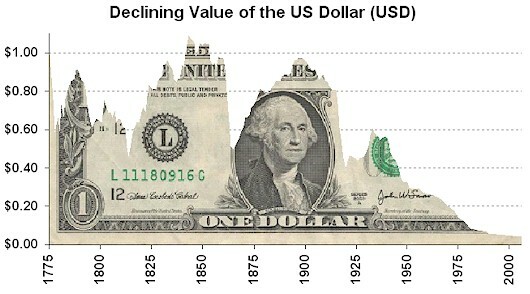 Below is a chart showing the falling value of the current American currency since inception (Data from MeasuringWorth.com ). Second worst hyperinflationary period in recent history with a monthly inflation rate of 5 quintillion percent. Between Oct 1, 1993 and January 24, 1994 prices doubled every sixteen hours on average. At the end of it, one novi dinar = 1,300,000,000,000,000,000,000,000,000 pre-1990 dinars . One account of the breakdown of the social structure is the example of a postman who waited a day to pay 780 phone bills with the equivalent of a few American pennies instead of trying to collect from the customers. Zaire went through a period of inflation between 1989 and 1996. In 1988, the highest denomination was 5,000 zaires . By 1992, it was 5,000,000 zaires . In the 1993 currency reform, 1 nouveau zaire was exchanged for 3,000,000 old zaires . The highest denomination in 1996 was 1,000,000 nouveaux zaires . In 1997, Zaire was renamed the Congo Democratic Republic and changed its currency to francs . 1 franc was exchanged for 100,000 nouveaux zaires . The overall impact of hyperinflation: One 1997 franc = 300 billion pre-1989 dinars . 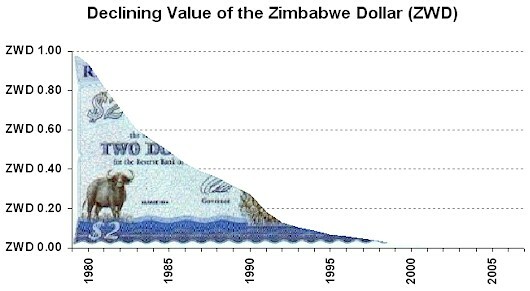 In early May 2006, Zimbabwe's government began rolling the printing presses (once again) to produce about 60 trillion Zimbabwean dollars . The additional currency was required to finance the recent 300% increase in salaries for soldiers and policemen and 200% for other civil servants. Mike Hewitt is the editor of www.DollarDaze.org , a website pertaining to commentary on the instability of the global fiat monetary system and investment strategies on mining companies. Your site appears to be the most straightforward (thank you). I need to know the Rhodesian dollar exchange rate from March 1979 to april 1980 and then the Zimbabwean dollar Exchange rate to the USD. If possible please provide the ZWD to USD for 1981 to 2003 (I am hopeing that you have a table somewhere) I attempted to access the Bank of Zimbabwe website but it blocked me. I will appreciated your ahelp enormously.